Cowboy Stole My Heart by Soraya Lane A contemporary romance filled with strong personalities, past debilitating pain (human and horse) plus hope. This couple often clash but at the same time respect each other. Sam has been hurt by love in the past so he has vowed to never make a commitment again. But the more he’s with Mia, the more he is enamored with her. Suddenly he’s noticing his car smells like old socks and his smelly dog. He is very respectful of women and Mia in particular. Maybe it’s having sisters. Maybe it’s a female author. But when he “kissed her slowly and carefully because her didn’t want to ruin her makeup,” I was impressed with his thoughtfulness. Maybe a little leery of him. Can he be for real? But this type of behavior is repeated often. Frankly, by the end Sam had won me over. Mia knows exactly what she wants. She goes out, earns it, and wins the day. I was amused by her constantly trying to be the dominant in every love scene. She laughs a lot and enjoys life. A woman you’d want as a friend. The epilogue has perfect timing and closure. Happily ever after. Well done. I received a copy of this book from NetGalley. Mia Ford is one of the River Ranch fortune heir. But she has proven herself as a champion horse jumper. Mia has just returned to the ranch in Texas but needs help with a stallion. The stallion is just untamable. Sam Mendes is a cowboy who has become famous as “the horse whisperer”. He travels the country giving demonstrations but he would rather deal with horses than with the traveling and dealing with all the people. He is offered the job of taming the stallion. Mia and Ford clash as both are head strong and opinionated with pre-conceived views of each other. Will they both be able to tame their natures while the Sam works with the stallion? The characters are well described and have great dimension. The book weaves together the past and present to make the story easy for the reader to follow. This is an exciting, heartwarming read!!! 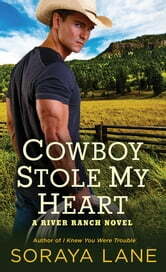 I volunteered to read Cowboy Stole My Heart. Thanks to St Martin’s Press via NetGalley for the opportunity. My opinion is my own. Selfishness and/or betrayal both hurt those used in a relationship. Mia and Sam have both experienced this pain, to different extremes... Pleasing start to a new contemporary western series. Liked Sam and and Mia and their interesting careers. Though Sam's story took too long getting to his betrayal. Would like to read the rest of the series. Voluntarily read ARC, through Netgalley and publisher, for honest review.